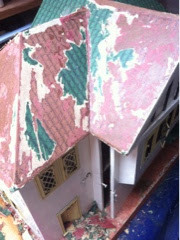 Remember the vintage houses I recently acquired and pledged to transform into things of beauty? Well, I've spent the majority of the weekend, scrubbing, scraping and sanding this beast to within an inch of it's life. Thought it was best to see what I'm working with before covering it all up again. 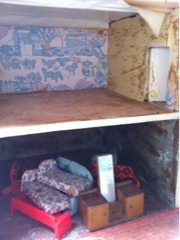 Structurally it seems in good condition, cosmetically....yuck. Nearly got a whole side clear!! 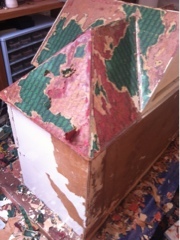 x3 layers of roof paper! Really old paint peels off very easily, thank goodness. Sticky-back, white vinyl c*@p on the ceiling. So far IMPOSSIBLE to remove. Arrgh! 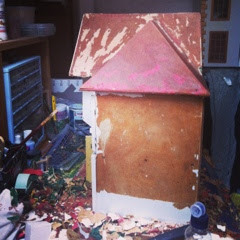 So, as you can see it's been a messy here as I tackle the first of x2 Vintage doll's house restorations. Apologies. It's not particularly nice to look at right now so here's a quick injection of 'pretty' from Saturday afternoon! 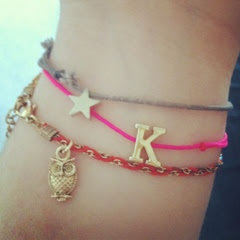 My Sister got me a little owl bracelet, because she love me innit. Dog walking with my favourite small person. 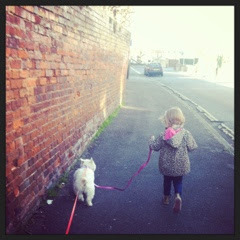 She was VERY excited about the pink lead. Stuff & things: Feeble Friday!